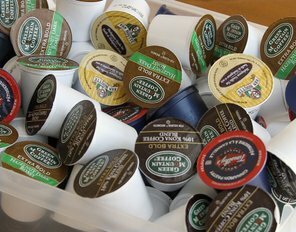 Are you tired of tossing your Kcups or Nespresso Pucks in the garbage? Are you tired of all the waste? Are you looking for an inexpensive and easy solution? Kcup Recycling Service offers you a way to recycle your kcups or Nespresso Pucks and keep the waste from going in our landfills. It's a simple, practical solution to an increasing problem with single cup brewers. Now you can enjoy all the benefits of a Keurig brewer or Nespresso brewer without feeling bad about the waste. For only $10 for 200 kcups or Nespresso pucks we will recycle and compost all the components. Keep reading to see how easy it is! There are many benefits to the Keurig & Nespresso coffee makers but the on-going challenge is what to do with the left-over kcup. The vast majority of people simply toss them in their garbage can. This is putting a huge strain on our landfills and the environment. pennies per cup you can enjoy your brewer and know that you're doing something positive for the environment. other company, Green Office Okanagan.